This is a really exciting initiative – talking with organizations looking to move to the clouds, be they public or private, some common themes emerge. There tend to focus around security, legal jurisdiction and data portability. 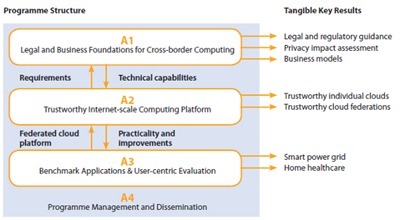 The TClouds initiative covers these three concerns within its objectives. A smart energy grid: TClouds will show how such energy-preserving systems can be migrated to a cloud infrastructure while increasing their resilience, privacy protection and tolerance against both hackers and hardware failures. In theory this is a truly exciting initiative. I’m a little dismayed that the only technical partner showing on the partner listing page is IBM. Nothing against Big Blue but there’s a bunch of other public cloud providers that I’d love to see involved in something like this. I’d really get excited if I saw the likes of Amazon, Rackspace or Microsoft involved as well.